After restarting to run at higher power than ever, the Large Hadron Collider has made its first proper discovery. Today, a team of scientists announced that they’ve found a new class of sub-atomic particles known as pentaquarks. 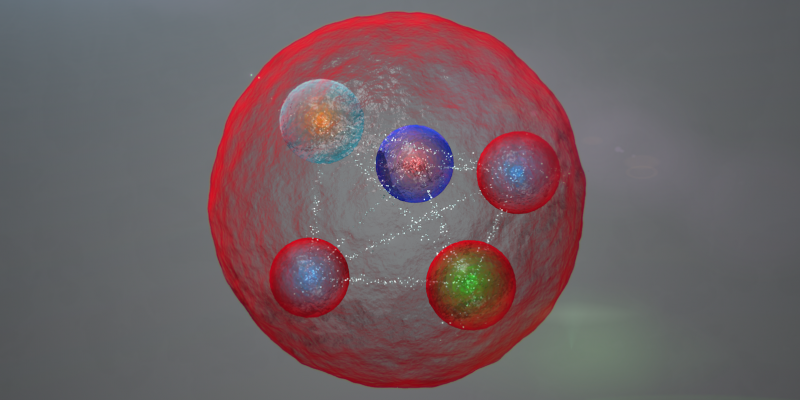 Quarks are a series of charged sub-atomic particles that come together to form larger particles—such as protons and neutrons, which are each made of three of the things (a class of particle referred to as baryons). First proposed in 1964 by American physicist Murray Gell-Mann, their existence changed the way people thought about particle physicists. But quarks can come together to form other entities, too. For a long time, people have speculated that another class of quark ensemble, called the pentaquark, could in theory exist. The pentaquark is, perhaps unsurprisingly, supposed to be made up of five smaller entities—four quarks and an anti-quark. Now, for the first time, researchers working on the LHCb experiment at the Collider have found evidence for their existence. The team has identified the existence of the peantaquark by watching for the decay of a baryon known as Lambda b. As it split up into three well-known particles—well known to physicists at least: a J-psi, a proton and a charged kaon, if you’re keeping track—the scientists observed a transition state in which two previously unobserved particles could be identified. Now, the scientists will study study the finer structure of the pentaquarks, to understand exactly how they’re bound together. It’s not the dark matter that CERN researchers are eventually hoping to find with the newly high-powered Collider, but it’s still another milestone in particle physics.